We will always do our best to match or beat any genuine quotation. Please also remember that when you order from us, you are buying from a real bricks and mortar company with a showroom, unlike some website only companies. 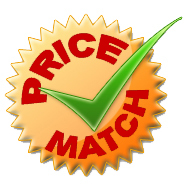 For a price match please email us details of the quote using the contact us page. If it is on another website that you have seen the quotation please email a link to the site for us.